SEATTLE – New Washington’s men’s basketball coach Mike Hopkins will retain assistant Will Conroy and add Tim O’Toole and Jason Hart to his staff, sources told The Seattle Times. O’Toole and Hart were assistants in the Pac-12 and both have ties to Syracuse, where Hopkins had been assistant the past 21 years. Conroy is the lone holdover from the previous regime led by Lorenzo Romar, who was fired last week after a 15-year tenure. It’s not immediately clear what will happen with Michael Porter Sr. and his son Michael Porter Jr., the No. 1 2017 recruit by ESPN and projected No. 1 pick in the 2018 NBA draft. 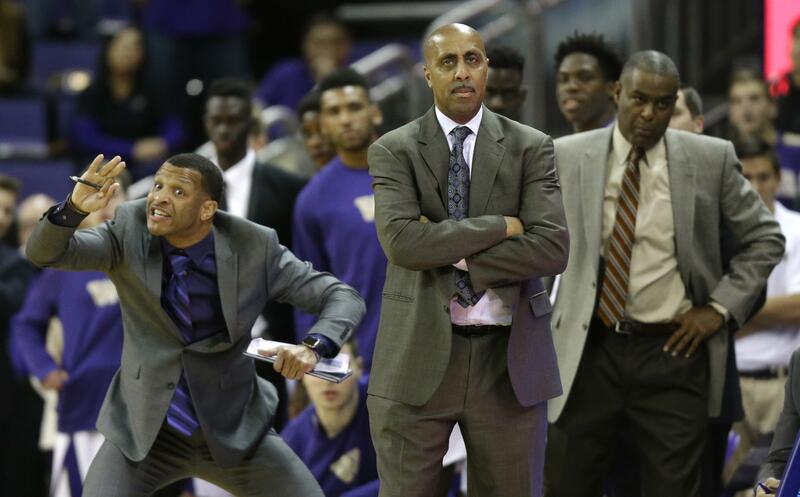 Porter Sr., a Husky assistant this season, has a year remaining on a two-year contract that pays him $300,000 annually. Reportedly, he’s a candidate to join new Missouri coach Cuonzo Martin’s staff and return to Columbia, Mo., where he was on staff with the Tigers women’s basketball team before joining UW. The NCAA allows three assistants, while other staff members are restricted from coaching on the court. O’Toole, a native of White Plains, New York, was an assistant at Syracuse, Duke and Stanford before spending the 2016-17 season at California. During his initial stint with the Orange from 1991-95, O’Toole coached Hopkins, who played at Syracuse from 1989-93. O’Toole also served director of basketball operations at Syracuse in 2012-13 when Hopkins was an Orange assistant. Hopkins recruited Hart to Syracuse, where he starred from 1997-2000. Hart left as the school’s all-time leader in steals (329) and second all time in assists (709). He also shares the Syracuse record for most steals in a season: 101, set in 1999. When Hopkins was a candidate for the USC job in 2013, Hart was reportedly set to join his staff. The Trojans chose Andy Enfield and he hired Hart, a Southern California native. During the transition from Romar to Hopkins, athletic director Jen Cohen placed Conroy in charge of the program. The former Husky standout is the school’s all-time assist leader, who helped Washington to two NCAA tournament appearances, including the Sweet 16 in 2005. Retaining Conroy, a hometown hoops hero who starred at Garfield High, could dissuade UW players from leaving – three Huskies indicated last week they were considering transferring – and help Washington hold together a 2017 incoming class that’s considered the best in school history. Porter Jr. will likely follow his father, and his relationship with the Huskies was apparently severed when the school released Romar, his godfather. Porter removed “Washington commit” from his Twitter bio last week. UW’s incoming class, which was ranked No. 2 nationally by ESPN, also includes: Garfield High guards Jaylen Nowell and Daejon Davis; point guard Blake Harris from Raleigh, N.C.; and and forward Mamadou Diarra, a Mali native who plays for St. Louis Christian Academy in Missouri. Published: March 21, 2017, 9:05 p.m.